ThimphuTech.com: A new poll. Topic: BBS News. A new poll. Topic: BBS News. Our Facebook poll is now closed. 42% of participants - almost half - check their FB account more than once a day. 29% of users check their FB about once a day. 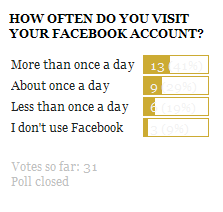 19% log on to FB less than once a day. And only 10% do not have an FB account. And now to this month's poll: BBS news. We are interested to know which editions of the news, if any, you watch. The English version, The Dzongkha one, both, or neither?